As September begins, many are already calling the season autumn. It is still summer. The part when summer and autumn tug a bit. There is a nip in the air, yet some days, the heat of hot wind still parches the skin. It is a restless time. Change is coming. We have entered Summer’s Dusk. Photo: September moonrise over Millville Plains. 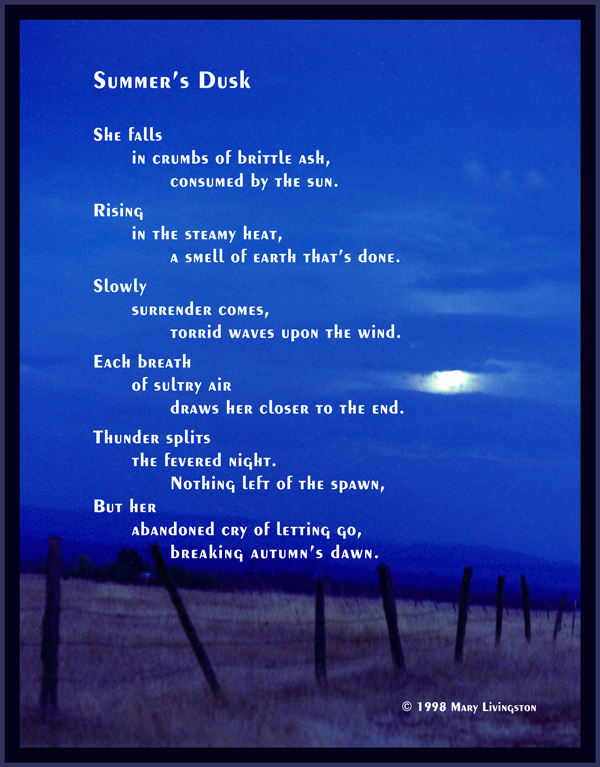 This entry was posted in Photography, Poetry and tagged Art, dusk, Inspiration, moonrise, photography, poetry, Summer by MaryALivingston. Bookmark the permalink. It is now mid October and autumn has fully arrived where I live. Summer held her own a bit longer this year.